One of Holland mayor Isaac Cappon’s many children, Johanna Cappon (known as Lavina) was born in 1894 to Cappon and his second wife. After receiving her education in home economics and returning to teach in Holland, she followed in her father’s footsteps as a pillar of the community and main contributor to Holland’s annual Tulip Time festival. Lavina was also an avid traveler and much loved by her family and friends throughout her long life. For more information about Lavina and her family, see our page on Isaac Cappon. 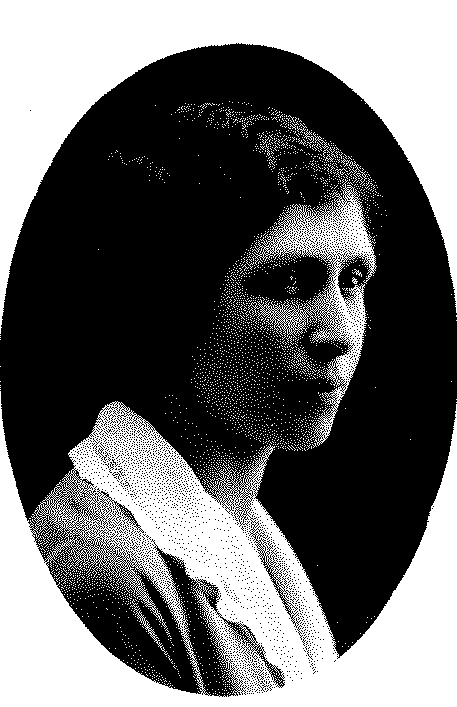 (Johanna) Lavina Cappon was the second child of Isaac and Jacoba Cappon; she was born on May 19, 1894. Lavina attended Holland Public Schools and Hope Preparatory School and then went on to Michigan State Normal College (known today as Eastern Michigan). Though she did not receive the best of grades there, she continued on to the University of Michigan to pursue a degree in Home Economics Education. 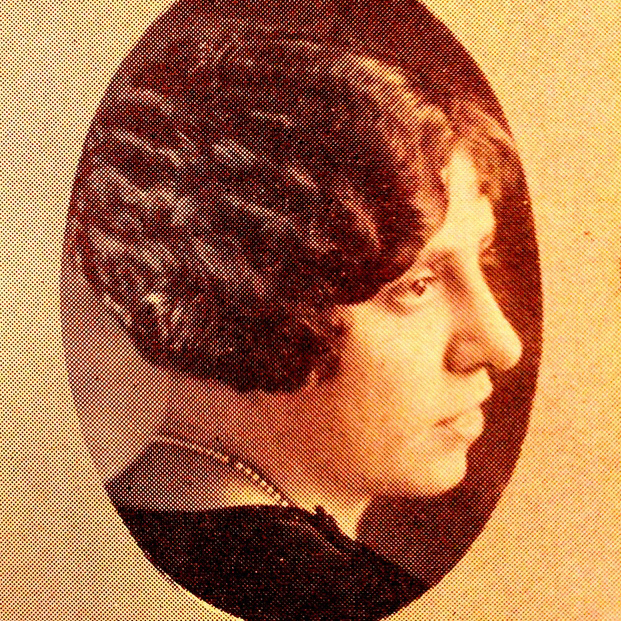 Lavina greatly enjoyed college life and created several scrapbooks to remember her time there. They include pictures of her with roommates and friends and of summer vacations at home in Holland. After graduation, Lavina began teaching home economics at Holland High School in the fall of 1916, returning to the Cappon home where she would live the rest of her life. Students remembered her as “small and feisty,” but her meticulous curriculum records indicate the same dedication to education held by her late father. An example of this commitment came in 1942, the year after the United States formally entered World War II. She and fellow home economics teacher, Gladys Bishop, traveled to Lansing, Michigan for special training from the Michigan Defense Council in homemaking. Lavina also taught domestic science for an hour each day at Hope College beginning in 1944 and an adult sewing class from 1952 to 1954. Also like her father, Lavina was interested in community and civic affairs. 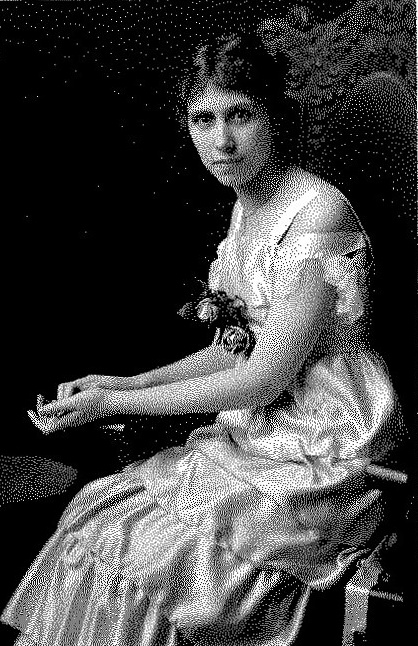 In 1918, twenty-four-year old Lavina signed a petition asking that Ottawa County support a proposed equal suffrage amendment; that year, she and other Michigan women gained the right to vote, two years before the passing of the 19th Amendment. At the local level, Lavina supervised the 1952 “Bake a Cake for Polio” contest for 7th through 12th grade girls in conjunction with the March of Dimes. She also helped charter both the Holland branch of the American Association of University Women (AAUW) and the Garden Club of Holland; throughout her eighty-four years, she was elected to various leadership roles within these two groups. Each May, both the AAUW and the Garden Club contributed time and efforts to one of Lavina’s greatest passions—Tulip Time. In 1952, Lavina served as co-chair of the Tulip Time Lunch Project, which, she was proud to report, had contributed $382 to the AAUW—more money than any of the Lunch Projects of the past five years, and in 1966, she held the position of executive chair of the Garden Club’s committee that put on the 20th Annual “Tulipvision” Tulip Time flower show. A glimpse of Lavina’s personality is revealed in an excerpt from a letter from Lester Theatrical Costumes to “Miss Cappon” regarding Tulip Time costumes: “We’ll put your mind at ease—yes, the hats go with the costumes. Wigs and shoes, though, are extra…please do not worry about the Belgian cap any further.” Her many dedicated hours of labor, however, are exemplified in a 1946 letter from the Tulip Time manager, in which he thanks her for her “quiet work with little to no thanks.” And in 1974, the Tulip Time Board publicly recognized her commitment to the festival, holding a luncheon in her honor during Tulip Time and asking her to be Grand Marshall of Wednesday’s Volks Parade. In an interview with the Holland Sentinel that month, Lavina recalled her best memories as a Tulip Time director—when Holland Klompen dancers were invited to “Chicagoland” in the 1940s and when they made an appearance on the Arthur Godfrey and His Friends variety show in the 1950s. In her time off from her studies and later from her teaching and community service, Lavina enjoyed traveling through the United States and Canada. 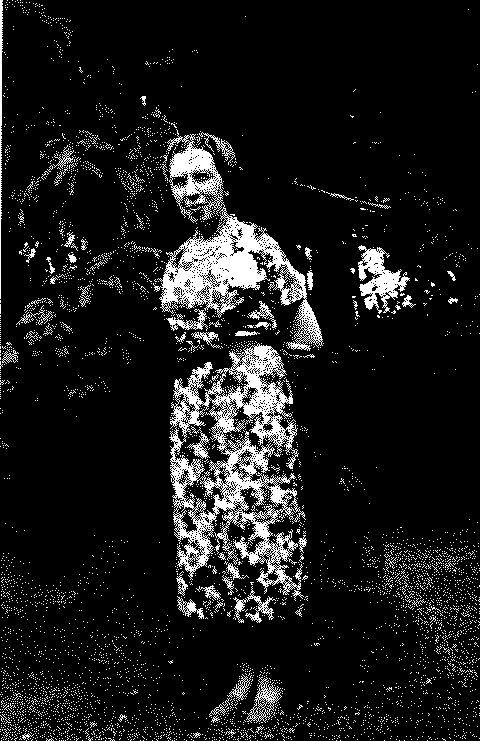 In one letter dated to the 1920s, she wrote to her family living “in Holland, Greenville, and Oklahoma” about how she had found her sister “Ida’s dress” in New York, visited the future New York home of “dominie and Mrs. Mclean” (her brother-in-law Paul and sister Edith), and experienced “the most wonderful thing”—a service by a Scottish minister in Central Park on Easter. She also traveled with friends and family to Colorado in 1926, Alaska in 1940, California in 1962, and several other western states between 1968 and 1971. Lavina was an avid and thoughtful reader. From a hostess schedule she created for the Women’s Literary Club (of which her sister Christine was also a member) we know of some of the various books she read, including Bury My Heart at Wounded Knee, an account of the systematic annihilation of the United States’ native population, Generation After, a call to the next generation of Jews to testify about the Holocaust, and Imperial Woman, a fictionalization of Empress Dowager Cixi, the concubine of the Xianfeng Emperor who ruled the Qing dynasty upon his death. In addition, Lavina was also very involved with the church she had attended since girlhood, 3rd Reformed. In the 1950s, she joined Women’s Guild, a newly-established society found in local Reformed Churches that especially catered to her abilities and interests in education, service, and growing in faith. In 1970, when she was seventy-six years old, the leaders of the church asked her, as a daughter of charter member Isaac Cappon, to unveil the church’s Michigan Historic Marker. Having lost her father when she was just eight and never having had a husband or children, Lavina stayed in especially close contact with the families of Isaac and Jacoba’s four other children. After having lived on her own since Jacoba’s death in 1930, she gladly invited both her niece Barbara (“Barby”) Maulbetsch and nephew Franklin (“Frankie”) Cappon, Jr. to stay with her for a time when they were both five, and she also took in her sister, Christine, and Christine’s husband and son permanently in the mid-1930s; she was not alone in the home again until Christine’s death in 1976. Lavina also exchanged many letters with her nieces and nephews, especially Barbara; in later years, Barbara remembered Lavina as an aunt who had a greater influence over her life than even her own mother. This article was written by a student intern at the Holland Museum. Learn more about Lavina and her family by visiting the Holland Museum’s website and by touring the Cappon family home. “3rd Church Dedicates State Historical Marker.” Holland Sentinel, June 3, 1970. “AAUW Branch to Grant Graduate Scholarship.” Holland Sentinel, May 23, 1952. Cappon, Lavina. 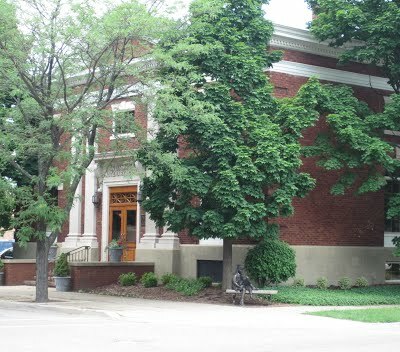 Cappon Family Papers, The Holland Historical Trust, Holland, Michigan. Cappon, Lavina, “Scrapbook, 1913-1916”. Cappon Family Papers, The Holland Historical Trust, Holland, Michigan. “Holland Community Evening School Adult Classes.” Holland Sentinel, October 14, 1952. “Miss Cappon Reminisces About Early Costumes.” Holland Sentinel, May 15, 1974. “Mothers Ready to March on Polio in the Holland Area.” Holland Sentinel, January 28, 1953. “Search for Origin of Klompen Dancing Leads to Interesting Background Story.” Holland Sentinel, May 17, 1961. “New Costume Show Set for Tulip Time Festival.” Holland Sentinel, May 10, 1965. Schoone-Jongen, Terence. The Dutch American identity: staging memory and ethnicity in community celebrations. Amherst, NY: Cambria Press, 2008. Swierenga, Robert P. Holland Michigan: from Dutch colony to dynamic city. Holland, MI: Van Raalte Press, 2014. “Tulip Time Attractions Reviewed.” Holland Sentinel, May 1, 1974.